Ever look at a knife block and wonder what 90% of the knives are used for? Well, you’re not alone. Most people who own a knife block or knife set tend to only use a handful of their knives and stay away from those that they don’t understand. But every knife has a purpose, and it’s important to know the difference between your knives so that you can cut and prepare your food properly. If you’ve ever tried to cut through a loaf of bread without a bread knife, you’ve probably made it through the crust and damaged the inside. A bread knife will ensure that this doesn’t happen. The blade of a bread knife is long and serrated, allowing you to easily cut through the harder crust but leaving the soft inside intact. A chef’s knife is the kitchen staple. It can vary in length, but the blade of the knife is very fine and curved. The purpose of this knife is to chop or slice fruits and vegetables, but many chef’s also use it to cut boneless meat. Yes, cheese has its own knife. A cheese knife can come in many different sizes, but it typically has a flat and very sharp blade with holes inside to make cutting and slicing cheese much easier. Every kitchen should come with a pair of kitchen shears. Yes, they are basically a pair of scissors, but they have a sharper blade that allows them to easily cut through certain items or objects more easily than your average pair of scissors. A paring knife is the smallest knife in the set. The purpose of the paring knife is to remove skins from fruits and vegetables, but it can also be used to chop small items such as herbs. The santoku knife is very similar to a chef’s knife, but instead of a curved blade, it has a straight blade so that the chopping motion can be done up and down perfectly on a flat surface. 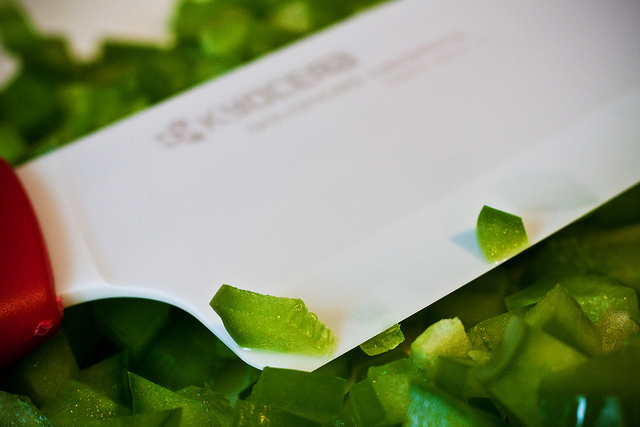 The slicing knife is a very large knife whose purpose is to slice through meat. When carving meats like a roast you should always slice through it with one swift motion instead of sawing at it. This will ensure that your meat gets the best texture. A steak knife is a table knife that is used to cut through hearty pieces of meat during your meal. It tends to be about one inch longer than your typical table knife and it has a straight serrated blade that will easily tear through any piece of meat. A trimmer knife acts like a versatile kitchen utility knife. It has a smaller blade with a serrated edge that allows you to easily remove the skins from fruits and vegetables, but it can also remove fat from meats and even cut through bread. If you don’t have all of the essential knives in your set, make sure that you at least have a trimmer. Stella Brown writes for Community Home Supply, a great resource for kitchen renovations.